Making the best crock pot General Tso's chicken couldn't be any easier. All you have to do is throw a few things into your crock pot, turn it on then find something else to do for the next four hours. I'm exaggerating a tad, but it is very easy. I skipped the part about browning the chicken in a pan before adding it to your crock pot. Other than that I was 100% telling the truth. This Crock Pot General Tso's Chicken is sticky and sweet with just the right amount of heat. After spending 4 hours in the crock pot, the chicken becomes quite tender and the sauce thickens and coats each piece in a delicious, edible blanket. I'm pretty stoked about this whole crock pot thing. I (finally) got my first one a few weeks ago and have been using it all. the. time. For some reason, I had it in my mind that crock pots were this thing that were only used by frazzled moms who live in suburban house farms and drive around in minivans full of car seats. Since I live in the city, don't have kids and ride my bike to get around town, I thought crock pots weren't for me. I was clearly suffering from I Think I'm Too Cool for Crock Pot Cooking. Shame. Shame on me. Thank god I got over that one. Hopefully, you're a lot smarter than me and have already figured out that crock pot cooking rocks. If you're now officially the only person left on the planet who doesn't own a crock pot, can you please do and buy one asap? Trust me, you want to. If you make The Best Crock Pot General Tso's Chicken recipe make sure you snap a pic and tag @theendlessmeal on Instagram so I can like and comment on your photos. I love seeing TEM recipes you create! 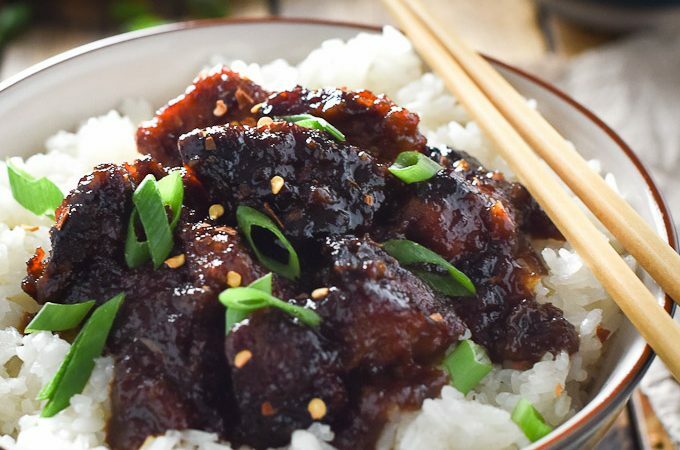 This Crock Pot General Tso's Chicken is truly the best. It is super easy to make, is sweet, sticky and has just the right amount of heat. You will love it! Add the chicken breast chunks, cornstarch and fresh cracked pepper to a plastic bag. Shake the bag until the chicken is coated in the cornstarch. Heat the grapeseed oil in a large pan over high heat. Add the chicken and sear it until it is well browned on all sides, about 10 minutes. Add the chicken and all the remaining ingredients to your crock pot and give it a stir. Set your crock pot to high for 4 hours. Note: some readers have found that their crock pots cook at a higher temperature than mine does. If this is your first time making this recipe, check the chicken after 2 hours and, if needed, lower the heat. Serve the Crock Pot General Tso's Chicken with a side of rice, some steamed veggies and a little sprinkle of green onions on top. Hi I just made this and my chicken is a very light brown (not like the picture!!) I didn’t use tomato paste, ginger, Chinese all spice (I made my own hoisin sauce but omitted food sensitivities). would this impact the color? Hooray!! You just put a giant smile on my face. So happy to know you’re enjoying the recipes! Yep, mine was burned when i checked on it at the 2 hour mark… will try 2 hours on low next time. I’m so sorry to hear that happened to you! My crock pot is the only one I’ve ever used, but another reader mentioned that cooking times do vary from one to the other. While the chicken should technically be cooked through (or almost) after you brown it, the slow cook in the crock pot makes it super tender. I see that you skipped the part where you brown the chicken in the pan. I’d like to skip this part too to save time, but I’m wondering, did you still do all of Step #1, coating the chicken in cornstarch, etc…? I have been looking for the quintessential General Tso’s Chicken recipe for years and you have hit it spot on! However, given crispy chicken pieces are part and parcel of a General Tso’ s dish, and given it takes only a few minutes to stir fry the chicken pieces, I couldn’t make myself put it all in the crock pot to cook for 4 hrs. I added a tsp of cornstarch to your sauce recipe and poured it over the cooked chicken and it was perfection. All in 15 minutes. Thank you for an excellent recipe. Great idea to stir-fry the chicken pieces! Yum! This was delicious! It was similar to something I learned to make when I lived in Hong Kong. I did add 1/4 teaspoon Five Spice Powder to the cornstarch. Also added 2 Tblsp. gojuchang and 1 Tblsp. sesame oil to the hoisin mixture. I also added cut asparagus during the last hour. I served with Basmati rice, roasted chopped peanuts and spring onions. This one is a KEEPER! Please keep them coming! Great idea adding gochujang to the mix! I’ve already gone through a couple big jars of that stuff after meeting its acquaintance only a few months ago. Love it! I think my crock pot (slow cooker here in the UK) cooks a little differently than yours as my chicken got a little frazzled! I turned it down to low after an hour on high then after 2 more hours it was done and the chicken pieces started to fall apart. The sauce was delicious although maybe a little sweet for my palate but it went down a treat with my family, our Chinese take aways don’t offer this style dish so thanks Kristen for another fabulous recipe. I wonder if there is a difference in the way crock pots cook? This is my first crock pot so I can’t say how it compares to others. I always thought they were the same! Happy to hear the family liked it! My crockpot cooked this in 2 1/2 hours on high. You bet every crockpot is different! 4 Hours and it would have been burned to a crisp! I’m so glad you brought that up. I’m going to add a note to the recipe about keeping an eye on it. Thanks, Karen! I had the same problem, chicken was overcooked in just 2 hours! Almost burned and turned to mush! Followed exactly. Oh no! It sounds like our crock pots cook a little differently. I wonder if cutting the chicken into larger pieces would solve the problem of it cooking so quickly. Made this for dinner last night and it was really, really good! The sauce was perfect. I added some carrots and red peppers to cook with the chicken and the carrots came out crisp tender and sweet, About a half hour before serving, I added some sliced mushrooms and broccoli. Everything came out so good on top of the jasmine rice. One note is that I used the LOW setting on my crock pot and everything was done in about 3 hours. Will definitely add this to my rotation. Way better than chinese restaurant fare. Thank you so much for your feedback, Liz! I love that you added veggies to the pot. I’m going to do that next time I make this, too! I believe you that this is the best General Tsos Chicken! It looks perfect :). Yum! That looks so good, I want to eat it right off the computer screen! And the recipe is way, way too simple. Can’t wait to give it a try. Lol, I am cracking up girl. I can totally understand your whole “crock pots are for frazzled moms” mentality. But, I am super excited you finally got one because this general Tso’s chicken looks killer! Super sticky and seriously delish, exactly how I like it! Can’t wait to see what you come up with next in the crock pot! Pinned! Cheers, my dear! This looks so wonderful. I love that it was made in a slow cooker! O that looks beautiful! You’re recipes always make me smile 😉 Thank you so much for linking that homemade Hoisin sauce! I’ve been dieing to make some, but didn’t know where to start! I need it allergy-free to homemade is the only way!) xoxo Happy crockpot-chickening!! !